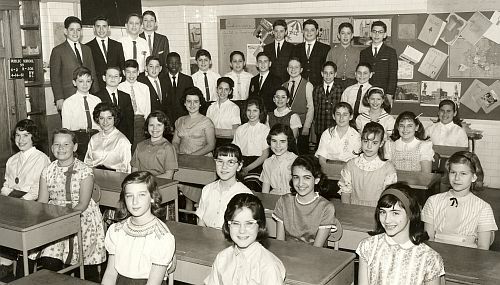 A Picture History of Kew Gardens, NY - Class Pictures - PS99 Grade 6-2 1961. Also thanks to Elsie Hoel for a student identification. The first girl in the lower left with dark hair has been identified as Nadine Weinstein. Other students in this picture (their names are in no particular order) are: Nadine Weinstein. Beth Hyman. Arnold Handwerker. Nancy Mayer. Diana Aziz. Myra Durkin. and Madeline Mart. Andrea Fecher is in the 2nd row from the right, 4th girl back. Please email me if you can identify any of the other people in this photograph.